At At Dinner4Two we love celebrating any holiday; it’s a welcomed opportunity to put our creative ideas to the test to come up with yummy and visually adorable food and treats. Our St. Patrick’s Day collection of sweet treats will deliver the pot of gold at the end of the rainbow we promise! 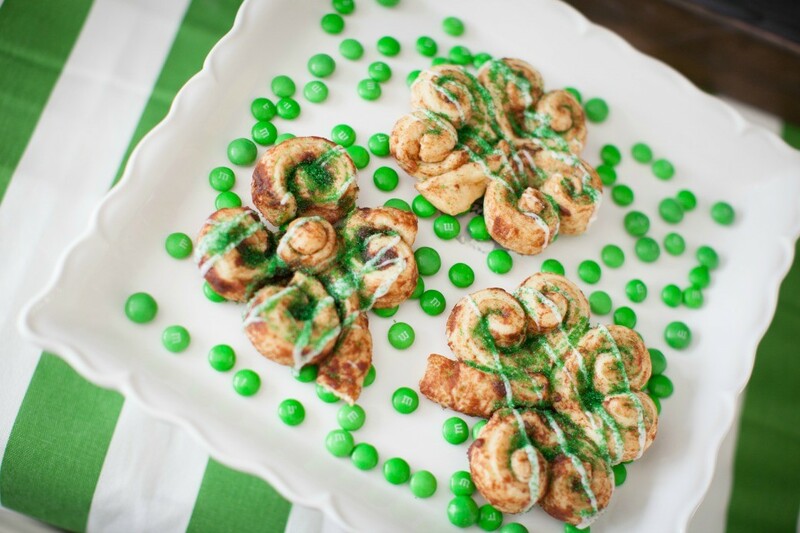 Check out our St. Patrick’s Day Shamrock Cinnamon Rolls. We put our creative spin on pre-packaged bake and serve cinnamon rolls by giving you two unique designs to bake for your special someone or to take into work to share with co-workers at the coffee station. 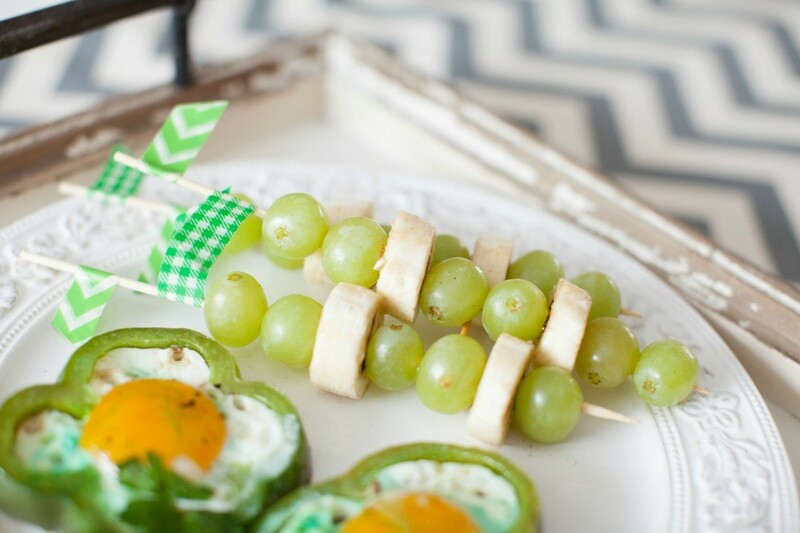 We promise you won’t find a quicker or easier sweet treat to celebrate St. Patrick’s Day with. They literally take a few minute to roll out and reshape into shamrock cinnamon rolls. On the adorable scale ranging from 1 to 10 they rank clearly at the top with a solid 10, we guarantee it! The frosting drizzles and green sparkly sprinkles are the finishing touches that give them their irresistible festive appeal. It’s important to choose the store brand of prepackage cinnamon rolls; the name brands don’t unroll allowing you to shape them into shamrocks and heart shamrocks. You’ll be able to get about 3-4 rolls from each package of eight cinnamon rolls depending on which shamrocks you are making. Remember it’s very important to purchased the store brand or off brand cinnamon rolls as they are the ones that will unroll. Trust us on this one! We tried to use the other brands and they simply don’t give way to unrolling. 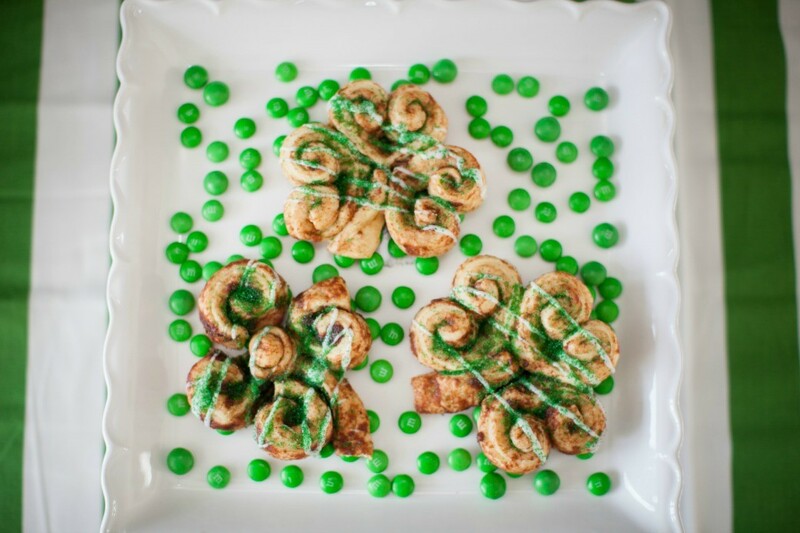 For the heart shaped shamrocks you will unroll each cinnamon roll and cut into six inch strips. Roll each end up one curl. Bring the curls around to form a circle and pinch the bottom of the circle to form a point. At this point they should look like mini hearts. You will need three of these hearts. Place them close together, with the point in the middle, the points should be touching. You want the hearts almost touching to allow for expanding while baking and maintaining their shape. Add a two inch straight strip for the stem. Bake according to package directions. 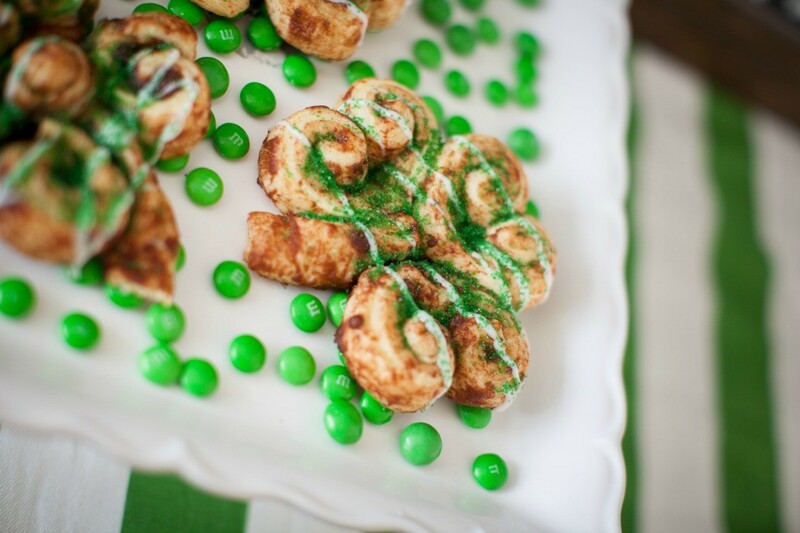 For the swirled shamrocks you will unroll each cinnamon roll and cut into two and half inch strips. Roll each strip into a circle and place four together to form the shamrock. Add a strip for the stem and roll up one smaller circle to add in the center. Again, place them so they are almost touching allowing them room to expand during baking. Bake according to package directions. Set aside and Let them cool completely. After they’re completely cooled prepare your frosting; if you do this step while they are cooling your frosting will set up and you won’t be able to drizzle it. Whether your frosting comes in a bag or in a little tub you are going to want to transfer it to a small microwave safe bowl and give it a few 3 second microwave blasts to make it a little runnier. You will know it’s the right consistency when you scoop it with the spoon and it easily drips off the spoon. 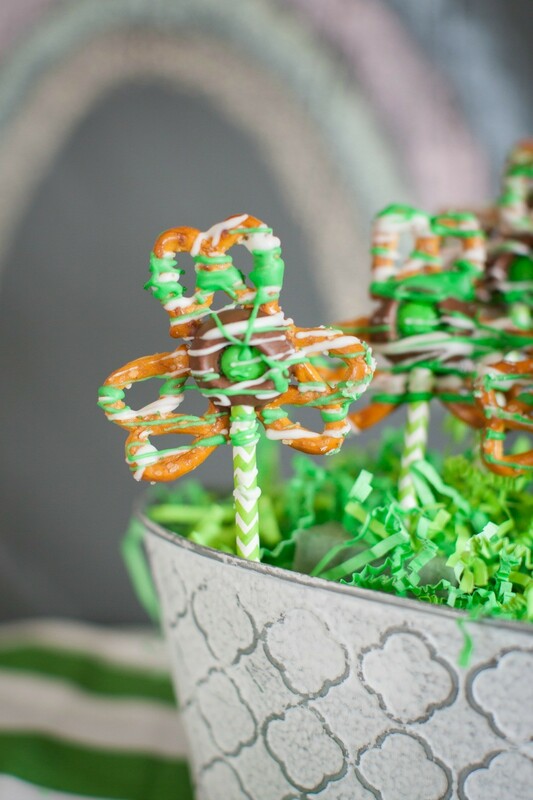 Take your spoon and scoop a small amount of frosting, letting it drip off the end of the spoon then drizzle it back and forth over one shamrock at a time. Before you move onto your next shamrock be sure to dust with your green sparkle sprinkles. These truly are fun to make and the looks you’ll get when you serve these little cuties will be your pot of gold. Enjoy!